If we had to guess Eric Carle's favorite color, we might say GREEN. After all, he's famously done a hungry green caterpillar, a greedy green python, a green elephant, a foolish green tortoise, green dragons, and even a green red fox. But then he's also famously done a brown bear, of course, a black and white panda, a homeless red hermit crab and a grouchy red ladybug, a blue horse, and confused chameleon of many hues. A proponent of strong, assertive colors, Carle has featured most of them in his seventy-plus books. 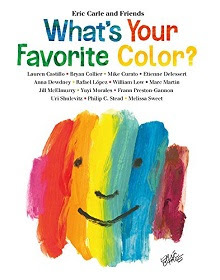 But in his latest picture book, What's Your Favorite Color? (Henry Holt and Company, 2017) Carle confesses that his favorite color is YELLOW, and backs that assertion up with his trademark yellow sun, indeed appearing in many of his books. Color is one of the artist's main tools, and in this latest companion book to his What's Your Favorite Animal? (see my 2014 review here), Eric Carle invites fifteen of his famous colleagues to submit their favorite, with a show-and-tell on the features of their chosen color. Bryan Collier favors BLUE, the blue of the balloons that makes him and his little daughter smile. Anna Dewdney picks PURPLE, the purple of the peacock in her yard and of the pantsuit in her closet. Ettienne Delessert insists on the indigo hue of Tuareg veils in the desert, and Yuyi Morales picks the vibrant Mexican pink of bougainvillea blossoms. Melissa Sweet counters with the gray of a Maine morning, the gray of fog, seagulls, and granite; while William Low selects BROWN, the color of his own neighborhood. Philip C. Stead's favorite is GREEN, the green of an elephant who just feels like being green one day, and Lauren Castillo loves the WHITE of snow that changes everything to white. Mike Curato picks MINT GREEN because it's the color of his favorite ice cream cone. Frann Preston-Gannon prefers ORANGE, while Jill McElmurray elects BLACK for its unpredictability. Mark Martin chooses the contrast of CRIMSON RED, the color of a flashy Australian parrot. The venerable Uri Shulevitz can't seem to choose just one, because, as he says, "a single color may feel lonely." So ALL COLORS it is! Carle's endpapers also salute several hues, with simple vertical wide-brush strokes that present stunning paintings on their own. Carle, the unofficial dean of American picture book artists, has created a book which honors his colleagues and no doubt will have young readers musing about their own favored hues. This one is a great choice for libraries, for a favorite young artist, or a favorite art teacher to use with classes. "A creative collection to savor one-on-one or to spark classroom art and writing exercises," suggests School Library Journal's starred review. PETE THE CAT HAS BUILT A TREE HOUSE. One by one his friends--Callie Cat, Thomas Cat, Marty Monkey, Emma Dog, and Grumpy Toad--show up and lend a hand with the construction. Pete is proud! Of course he invites all his helpers to a tree-house-warming party. Pete and his pals climb up the ladder. But when they all get into the tree house, there's just one problem. Cheerfully Pete shrugs and agrees to expand his construction. Emma Dog draws up the blueprints and, and like most new houses, all the friends add their ideas for the perfect tree house. They start the expansion project, each one working on a special section to do their own favorite thing. Marty Monkey has a video game arcade. Pete has a wave pool for indoor surfing. There is a bowling alley, a movie theater, a ski park, a climbing wall, and an ice-skating rink. Every friend has a place for his own favorite thing to do. There's just one problem. 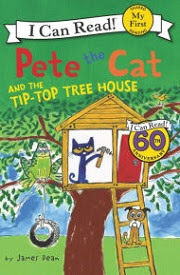 It's the old story of too much of a good thing, in James Dean's newest, Pete the Cat and the Tip-Top Tree House (My First I Can Read) (Harper, 2017), as Pete the Cat and his pals descend to head for the good old jungle gym where they can all play together. James Dean's story of the perfect fantasy play place is a likable lure to get emergent readers to practice their beginning reading skills while living out their summer play fantasies in this new My First Book in Harper's famous I-Can-Read series, now celebrating its fortieth anniversary. THE SUN RISES. POWERFUL CONDENSED RAYS STREAM DOWN. Just as The Man of Steel pulls up his tights and ties on his cape, our boy springs from his bed to face the day. The crayoned drawing of Superman on his wall inspires him to rise to the occasion. He pulls on his uniform and screws up his courage to face his first challenge, courageously facing the fierce taste of his kryptonite-green toothpaste. Patooieee! Just as Clark Kent's hurricane breath stops the bad guys, our kid spits and rinses and faces the next task with minty-fresh zest! It's up, up, and away, and into the day, and our young hero at last heads out the door, hoisting his heavy backpack and bulky lunchbox as if they were feathers, and flies outto leap with a single bound onto the bus, just as his hero soars away to dominate his day. 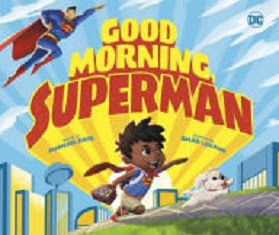 Waking up is hard to do, but in this companion book to his Bedtime for Batman (DC Super Heroes), (read review here) Michael Dahl's newest DC Super Hero saga, Good Morning, Superman! (DC Super Heroes) Capstone Press, 2017) takes on the terrors of the morning rush with all the courage of that caped crusader in Metropolis. Summoning a superhero to get a youngster moving in the morning isn't a bad idea, and Dahl's narration gets a lot of its KAPOW! from the well-crafted and designed illustrations of artist Omar Lazano, who uses the dramatic style of DC heroes to good affect, switching off comic panels with full-bleed illustrations in varied page layouts with heroic, pixel-powered colors as his Superman shows the way to take charge of his day. "An excellent resource for parents attempting to wrangle their little superheroes' powers for good," suggests Kirkus Reviews. The boat swayed beneath me. I spread my feet apart to balance and lifted my face into the wind. It was awesome. "Put this on, Trav." Mom ambushed me with a red and black suit and held it open for me to step into like I was five. "What? No. What is that?" "An immersion suit. It's going to be chilly on the water." "Stacey's not wearing one!" I protested. "Older and wiser," my sister smirked, still texting. I let Mom do up the zipper. Since my gym accident, Mom had been hovering. "And I hid some animal crackers in the pocket in case you want a snack." "Mom!" said Stacey. "The last thing Chunky Monkey needs is a snack." Travis's mom has been all over him like that immersion suit since he had a serious fall from the high bars in gymnastics. But he has to admit that his sister's teasing about his weight gain during his recovery is on target, Still, Trav stubbornly insists on staying on deck with the other tourists when his parents go inside the warm windowed cabin. It's just an average tourist boat heading out on the ubiquitous whale watch cruise. What could happen? A lot. A rogue wave capsizes the boat and dumps Travis into the icy waters of the Straits of Juan de Fuca. 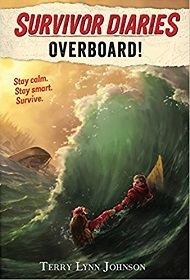 In the chaotic scene his sister and parents are nowhere in sight, as everyone, despite their life jackets, struggles to stay upright in the wild waters. Nearest to him is Marina, the daughter of the boat's captain. Marina had been assisting her dad in the run-through of the required safety speech when the wave hit, and now she takes over, telling Trav what to do. She's, like, the world's authority on survival at sea. It's like being shipwrecked with Stacey. But these two unlikely partners turn out to be a lucky pairing for survival. Marina knows a lot about the dangers of cold water immersion and the dangers of hypothermia. "We have about an hour," Marina gasps. "Our arms are going to stop working. Then we'll probably lose consciousness. Maybe we have more than an hour since we're wearing lots of layers. You'll last longer than me with that suit. And body fat insulates, too." she adds. Marina's dismal message is that they have less than an hour to save themselves, even if they assume a fetal position and huddle together to conserve body heat, a position that's almost impossible to maintain since they have to struggle just to keep their heads above water and breathe. Marina knows a lot, but she is not much help with a injured arm. Travis, on the other hand, has gymnastics training and an immersion suit. And after all, when else will being a flexible chunky monkey come in handy? And it turns out that Trav and Marina have the right stuff, right down to those animal crackers in his pocket and the fire-starting kit Marina has in hers, in Terry Lynn Johnson's forthcoming Overboard! (Survivor Diaries) (Houghton Mifflin Harcourt, 2017). Johnson builds plenty of suspense as her unlikely hero fights to save himself--and Marina, who turns out to be prepared with the one weird factoid that gets them rescued. For hot summer afternoons, this one is both a chill thriller and a quick and guaranteed riveting choice for middle readers. especially reluctant ones, and is the first in a proposed series of short survival stories. (Coming next: Avalanche! (Survivor Diaries, just in time with life-saving skills for ski season.) Appended is an author's note which adds more Coast Guard-approved information about survival in frigid waters. "I AM NOT VERY BIG. THEY USE ME ONLY FOR SWITCHING ENGINES IN THE YARD. I HAVE NEVER BEEN OVER THE MOUNTAIN," SAID THE VERY LITTLE ENGINE. THE DOLLS AND THE TOYS WERE READY TO CRY. "I THINK I CAN. I THINK I CAN, I THINK I CAN!" SAID THE LITTLE BLUE ENGINE. AND SHE HITCHED HERSELF TO THE LITTLE TRAIN. 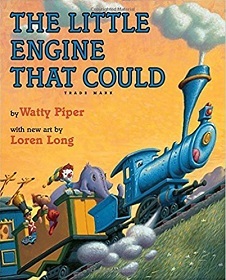 And in some of the most famous lines of twentieth-century literature, Watty Piper's Very Little Engine chugs bravely over the mountain, in a iconic story that over the decades has been published in many editions, from Little Golden Books to large-format picture books. Now along comes noted children's artist Loren Long to take on the challenge of re-illustrating a major new edition of this classic. Loren Long has long had an affinity for vintage vehicles, having created the much-loved little old farm tractor Otis, (see reviews here) who has been literally put out to pasture, an outcast in the weeds behind the barn, replaced by a bigger and shinier new tractor with all the bells and whistles. But then he is called out to rescue his friend when all the others fail. Otis is certainly the storybook descendant of the Little Engine That Could. Loren Long's new illustrations for Piper's beloved book update the Little Blue Engine only by a decade or so, keeping the rounded shapes and anthropomorphic charm of Piper's creation, while adding, as is Long's wont, lovely spreading landscapes of vintage farm pastures and wooded hills often described as Thomas Hart Benton-like. Long's little train, filled with dolls, toy animals, and "good things to eat" continue the mood, the giraffes' heads high above their baggage cars, the elephants' trunks dangling over the sides, as the dolls, led by the clown as spokesman, beg for help from a series of more powerful engines who scorn the little load of toys as beneath their dignity to haul. Loren Long's new edition keeps the original text intact as the Shiny New Engine, the Big Strong Engine, and the Rusty Old Engine turn down the the clown's plaintive plea, and the task falls to a tiny but plucky little switch engine. Modest but stalwart, she persists to deliver her "jolly load" and the rest is children's literature history. Long's strong but winsome acrylic illustrations are both powerful and charming in this welcome new edition. The theme of the triumph of the small over the large and grand is one that small children have always understood, and for any child who does not have this timeless story, Loren Long's new The Little Engine That Could (Philomel Books, 2017) is a welcome must-have. One day when Narwhal was out for a swim, he found himself in new waters. "Me?" said Narwhal. "I'm Narwhal, the Narwhal. The Unicorn of the Sea." "I'm a jellyfish," said Jellyfish. "You don't look like any fish I've ever seen, but you do look kind of jelly-ish," replies Narwhal. The two regard each other skeptically, each wondering if the other is a figment of his imagination. "I can't believe this! The thing I am imagining imagines that it's imagining ME!" 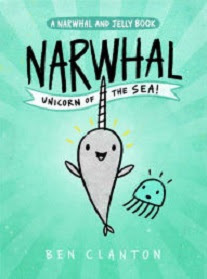 Ben Clanton's new Narwhal: Unicorn of the Sea (A Narwhal and Jelly Book 1) (Tundra Books, 2017) offer three silly stories about this dynamic oceanic duo, told in comic-book-framed format, with plenty of humorous banter between the unlikely comrades, just right for primary readers who are looking for a touch of subtle and sophisticated humor in their easy-reading literature. Clanton's less-is-more artwork is reminiscent of masters of the genre such as P. D. Eastman and Syd Hoff, with simple blackline drawings backed by skillful use of color. As Kirkus Reviews puts it succinctly in their starred review, "Undersea adventures have never been so darn cute!" HER NAME WAS DIANA AND SHE WAS ON A MISSION TO SAVE THE WORLD. Before Diana the Warrior Princess, daughter of Zeus and Queen Hippolyta of the Amazons, rescues downed aviator Steve Trevor in a battle with the Nazis, she has never seen a man. On an island of women, trained under her aunt, Antiope, Diana uses her strength and courage to rescue the injured pilot, learning from him that the outside world is engaged in a great war. As Diana Prince, she travels with Steve to London to join in the forces fighting to end the war, using her speed, strength, and skill to fight the foe and becomes known as Wonder Woman, the world's first female superhero. In Steve Korte's I-Can-Read Wonder Woman: I Am an Amazon Warrior (I Can Read Level 2) (Harper, 2017), kids can read for themselves the story featured in the recently released blockbuster movie, Wonder Woman. Korte' tells well the story behind the first woman superhero who made her debut in DC comics in 1941 on the brink of World War II. Like Superman before her, Diana Prince chooses to live incognito, but with her bullet-stopping bracelets, Lasso of Truth, and famed lightning-fast reflexes, Diana Prince also morphs into Wonder Woman, fabulous bustier, high-heeled boots and all, to save the world from evil whenever needed. 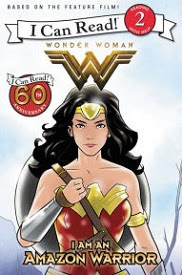 Since the new Wonder Woman movie is rated PG-13, this book is the next-best introduction to America's super woman, a founding mother of the Justice League, and gives young readers an opportunity to be up on the latest movie and keep their super-reader skills up to superhero levels at the same time. Little Bunny saw Mama's open purse. He took some pennies for his bank. Nothing bad happens. So when Little Bunny sees a friend's new car, he puts the car into his pocket and takes it home with him. And then one day he sees his favorite candy bar for sale. He takes one down from the shelf and takes it home. But although no one seems to notice, Little Bunny hears a voice somewhere inside saying, No, No! Something about what he did seems bad. He feels sad inside. Finally, he has to do something. Little Bunny tells Mama about what he did. He gets the pennies from his bank and gives them back to her. With her help, he takes the car back to his friend and returns the candy to the storekeeper. 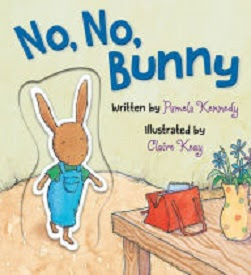 Bunny makes amends, with both contrition and restitution in Pamela Kennedy's new board book, No, No, Bunny (Worthy Kids/Ideals, 2017). Mama is forgiving and loving, and his friend and the storekeeper are glad and accept his apology, in a simple little lesson that little ones can share. Kyle's on the school bus, nose in his trusty insect book, while his seatmate Ginny natters on and on about the virtues and vices of the celery sticks in her sack lunch. Trying to be sociable, Kyle volunteers something that makes Ginny's eyes bug out. "Mom didn't have time this morning, so I'm buying my lunch in the cafeteria." "How hard can it be?" I said. That question is Kyle's first mistake. Ginny leans in dramatically. #1: DON'T HOLD UP THE LINE. #2: DON'T TAKE TOO MANY THINGS. #3: DON'T FORGET TO PAY. #4: ALWAYS EAT WITH YOUR CLASSMATES. #5: HOLD ON TO YOUR TRAY. #6: NEVER AGGRAVATE THE LUNCH LADY. #7: NEVER, EVER, TALK TO THE BIG KIDS. Kyle doesn't like rules. They are too easy to break. His bug book under his arm, he scurries nervously down the hall to lunch with the other fifth graders like a line of army ants, the scary sixth graders hot on their heels, looking more like a swarm of yellow jackets, with the worst bus bully, Arthur, right behind him. Yikes! He's already broken the first rule of survival. But Food Service Guy barks at Arthur. Quickly, Kyle stammers out a truthful explanation. "It's not his fault," I said. "I was taking too long." In short order, Kyle finds himself breaking every one of Ginny's rules. He piles his tray with all the choices and gets busted by the Lunch Line Lady. He doesn't know his PIN to pay the Register Woman, and when he hustles to get the last empty seat with his class, he trips and fall flat, the contents of his tray splattering everywhere. Every kid in the room turns to look and in that time-honored school custom, they hoot with one voice. All the Cafeteria Ladies have had it with Kyle. The Lunch Monitor glares down at him. "That's it! You've caused enough trouble for today." Eyes bulging like a beetle, she points a skinny, hairy appendage toward the sixth grade table, to the only empty seat in the house, right next to Arthur the bully. He was hunched over his food with five other meat-eating water bugs. What could I do? "Hey, Dweeb! Thanks for covering for me in the line," Arthur says. 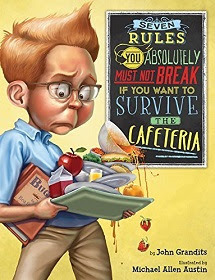 It's The Revenge of the Nerd, in John Grandit's Seven Rules You Absolutely Must Not Break If You Want to Survive the Cafeteria (Houghton Mifflin Harcourt, 2017), in which Kyle encounters all of the hazards of the school cafeteria--the bully, the menu, the wrath of the various Lunch Ladies and Guys, the dropped tray, and (horror of horrors) having to sit with the Big Kids. The only nemesis he navigates easily is the food. Sure, the pasta may look like worms, but creepy-crawly critters are Kyle's passion, and while slurping up his spaghetti, he engrosses and grosses out the sixth graders with his true tales of fifty-feet-long tapeworms and headless living cockroaches. Artist Michael Allen Austin ably portrays his entomology-obsessed hero as the perfect preppy nerdboy in his pressed blue oxford shirt and scholarly glasses, with beloved bug book under his arm. Kyle is the quintessential bully bait, but also one with a secret weapon--he's a nice guy who knows really cool gross stuff. Austin's illustrations fill the full-bleed pages with comic bobble-head caricatures of the usual suspects of the middle-grader school scene, sure to tickle kids and a sure-fire hit for back-to-school reading. For more first-days of school fun, pair this one with Grandit's and Austin's comedic and congenial companion book, Ten Rules You Absolutely Must Not Break if You Want to Survive the School Bus. AFTER PJS, BRUSH AND COMB,I SETTLE DOWN WITH A GENTLE OMMMMMMMMMM! CONNECT TO THE SOOTHING SOUND. CONNECT TO THE WORLD AROUND. Plushy lovies, gentle lullabies, bedtime stories, baby blankies, cute nightlights, soothing sounds--through the ages parents have diligently tried many ways to help their children fall asleep. Jordan moves on to the TADASANA--the mountain--standing sturdy and strong. and the UTTANASANA, in which the child sits, with knees bent up, grabbing toes and kissing the knees. Next comes the ADHAMUKKA SVANSANA, which the author names the dog-tired down dog, and then the Happy Baby (on back, grabbing toes), which Jordan calls the bedtime boy, and ending with the NAMASTE, the pose of thankfulness. The author suggests that these poses are snooze-inducing for both the overstimulated and the over-tired child, and her gentle rhymes and artist Diana Mayo's calm blue-hued illustrations are also soothing and should invite sleep. 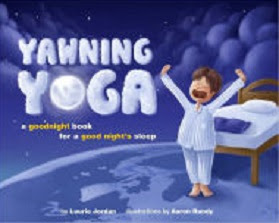 Prepare for this one with Mariam Yates' Good Night Yoga: A Pose-by-Pose Bedtime Story (see review here). I know you ordered a kitten, but we ran out of those. Caring for your lion is easy. Just follow your handy guide. Step 1: Take a deep breath and carefully open the crate. Clearly the kid is already in trouble. You expect a sweet little kitty cat and you get a full-sized maned lion? This is going to require more than deep breathing! And then there’s that next direction, a seeming non-sequitur. Step 2: Locate the enclosed feather. Keep it handy in case of emergency. This is getting ridiculous! The kid is supposed to fend off a lion with a feather? Try NOT to look like a zebra or a gazelle. Or a bunny. Thanks for the warning, Gilligan! The following step, related to the feeding his new pet, has the kid ordering ten Extreme Pizzas, which, with extra toppings--a bit of zebra burger and antelope antipasto--seem to give the boy a respite from being prey while he works on the rest of the steps to lion management. These become pressing when the Lion, still a little peckish after his pizza snacks, disobeys the next injunction and swallows the UPS guy. The kid is forced to tickle his tonsils with the aforementioned feather until he barfs up the poor delivery man. So that's what the feather is for. O-kay. With that out of the way, our kid proceeds to unpack the Potty Training Kit (Some Assembly Required) and fill it with 100 pounds of Scoop-De-Doop Cat Litter, which, while strenuous, is easier than getting the lion to use it. 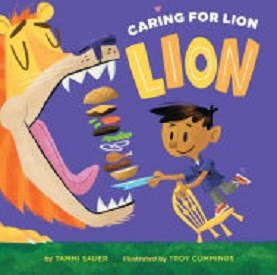 And our poor newbie pet owner is still not even halfway through the steps in the lion care manual, in the comedic Tammi Sauer's spoofy, tongue-in-cheek, and sensationally silly new book, Caring for Your Lion (Sterling Books, 2017). Sauer's co-owner, artist Troy Cummings, uses his considerable digital cartooning skills to document the process of domesticating a pet who is not exactly what it was cracked up to be. For more pet-care fun, share this one with Jodi Moore's When a Dragon Moves In or Jane Yolen's How Do Dinosaurs Choose Their Pets? WHEN YOU LEAST EXPECT IT, SOMETHING SPECIAL WILL GET YOUR ATTENTION. HE'LL INVITE YOU FOR A PLAYDATE. Not everyone has a friend from outer space, but you have welcomed your extraterrestrial friend before and even taken him to school for the day. Somehow he managed to blend right in, even though your teacher did keep trying to adjust her glasses. And now.... HE'S BACK! He motions you toward his spaceship, sitting on the lawn with its motor running. Should you go along? Well, who wouldn't? Mom is distracted when you ask for permission, so you promise to be back for dinner. And then, with a GLEEP, your alien takes the controls and you rise into outer space. YOU'LL HAVE THE RIDE OF YOUR LIFE! YOU'LL POLITELY DECLINE ANYTHING THAT STARES BACK AT YOU. Then it's time to take off for some alien fun. There's a stellar fort to build, and then your alien takes you around the neighborhood to meet his friends. They don't look too much like the gang at home. SEEING ALL OF THEM WILL MAKE YOU FEEL... ALIENATED! It's hard to feel at home when you are actually in another solar system. The aliens invite you to play their favorite game, but your skills aren't quite up to scoring. You don't know exactly what you did, but it seems that you ruined the whole game. But your alien seems to remember his day on your planet and gives your hand an empathetic squeeze. YOU KNOW YOU HAVE THE BEST FRIEND IN THE HISTORY OF THE UNIVERSE! 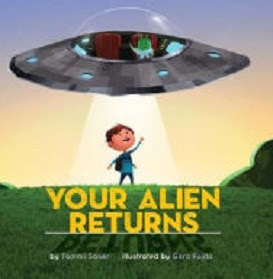 There's no place like home, as Dorothy observed from Oz, and in Tammi Sauer's sequel to her noted 2016 book, Your Alien, (see my 2016 review here), the homing instinct kicks in, and in a nanosecond his very own E.T. whizzes him home just in time for dinner. It's not goodbye, but see you later, in Sauer's follow-up science fictional, trans-spacial friendship tale, Your Alien Returns. (Atheneum Press, 2016). Artist Gora Fujita again provides the detailed illustrations of interspace fun and games, while Sauer's text, with its light theme of accepting and appreciating differences leaves a warm and fuzzy message that continues the mood of the first book. Pair these two for an interstellar treatise on the value of friendship wherever you find it. Kirkus Reviews says that this sweet story allows "readers to tag along with the pals into the next phase of the ultimate in long-distance friendships." ON A WARM SUMMER DAY, ELLIE STROLLED THROUGH HER HOME. Thanks to Ellie's awesome artistic efforts, the old zoo has been remade anew. In their comfy new quarters, the zoo residents are cheery. Every one of the animals welcomes Ellie with loud greetings. Hippo snorts, Rhino grunts, and the monkeys hoot out their hello to Ellie. Everyone is bright and cheery, excited about seeing all their new visitors at opening time--all except for Lucy the Giraffe, who is indeed looking listless. "WHAT'S THE MATTER?" ELLIE ASKED. "THE ZOO IS TOO NOISY. I CAN'T SLEEP!" MOANED LUCY. That is too bad. Ellie raises her voice to request that the others keep their noise down, but they can't even hear her over the cacophony of critter sounds. But one sound stands out--Betty Bluebird's melodic song, and Ellie gets an idea. What if she could organize the zoo animals into a chorus--one that actually sounds...well..,GOOD? Who can help all the animals sound soothing so Lucy can sleep? It's Gerard the Gorilla, lover of the symphony orchestra to the rescue, and with a little cajoling and rather a lot of rehearsing, the zoo animals learn to blend their voices into a soothing chorus of sound. ISN'T THIS GREAT, LUCY?" ASKS ELLIE. But Lucy is already in dreamland, in Mike Wu's brand-new second story of Ellie, Ellie in Concert Disney Hyperion, 2017). Wu's gentle tale of turning cacophony into harmony is illustrated in his softly shaded hues executed in watercolors, gouache, and pencil, making this zoo story also a soothing bedtime story,with the added bonus of Gerard's zoo symphony, "Betty's Theme," composed by Andrew Jimenez, printed as sheet music inside the dust jacket. 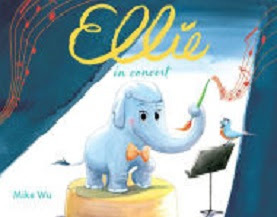 Share this one with Wu's first book about his resourceful little elephant heroine, Ellie (read review here). A DAY PIGS WILL FLY? Everyday is a red-letter day for Mo Willems' peculiar pair of pals, an elephant named Gerald and a pig named... Piggie, now appearing together in a collection of their peerless beginning readers which celebrate their exuberant but unusual friendship. Despite his size, Gerald is cautious, careful, and, to tell the truth, a bit of a nerdnick. Despite her petite stature, Piggie is boisterous, adventurous, and endlessly enthusiastic. Their new collection of best-selling and award-winning easy reader books includes five of their funniest stories, An Elephant & Piggie Biggie! (An Elephant and Piggie Book) includes five of their funniest stories, Today I Will Fly! (An Elephant and Piggie Book), Let's Go for a Drive! (An Elephant and Piggie Book), Can I Play Too? (An Elephant and Piggie Book), and that culinary killer-diller, I Really Like Slop! (An Elephant and Piggie Book). Only Gerald and Piggie could figure out how to include their friend Snake in a game of catch, or assemble everything they need for a drive--sunglasses, umbrellas for two, a map, their valises--until Gerald notices one thing they forgot--they don't have a car. Only Piggie could prepare her favorite food for her friend--that porcine specialty, a home-brewed bowl of slop--and only the persnickety Gerald would take a sip, despite the flies, just to please his best friend. 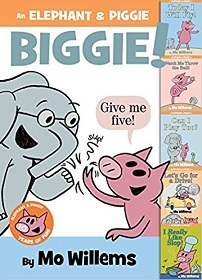 This is a five-for-the-price-of-one deal, and no preschooler should have to prepare to be an emergent reader without these hilarious and, yes, heartwarmingly poignant stories of Elephant and Piggy. and their truly BIG friendship. It's a biggie bargain, all right! With that hard-to-resist invitation, youngsters are invited to follow the sparkly green ribbon linking them to those familiar farm animals and implements. There are plenty of both for most preschoolers in this title, from a big honking machine like the red tractor to cute tiny farm animals to find when they follow the tactile trail. As an additional inducement, there is a die-cut peephole on each page with a clue to what they will see on the following page to lead youngsters on with each turn of the sturdy pages--a duckling, a little yellow chick, a sheep, a mama chicken in the cozy coop described simply as a little house with nest boxes, and contented cows. An added trick reverses the way from back to front by following the various insects strategically placed to be visible through the die-cut take-a-peek holes. 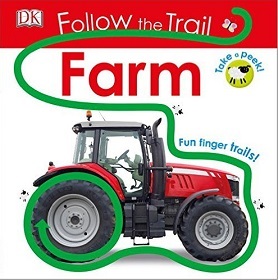 DK book designers are past masters of putting stuff on the page for maximum appeal, and in this board book in their Follow the Trail series, Follow the Trail: Farm (Dorling Kindersley, 2016), young children will be led irresistibly through the book while working on their vocabulary of farm animals and insect names and equipage of the typical farm while also developing hand-to-eye coordination and making some animal sounds along the way. This is an appealing book in a engaging series for home or early childhood education purposes that leads the child toward independent individual interaction with a book. Some other books in this toy-and-movable book series are Follow the Trail: Trucks, Follow the Trail Wild Animals, Follow The Trail: Baby Animals, and Follow the Trail: Baby Dinosaurs, showing the way to meet the many proclivites of preschoolers. And trailing behind, making tracks as fast as his little treads can rotate, is Little Excavator, followed by his spotted pooch pal. Little E is born to dig, but he's not quite ready to rumble with with the big boys. The Big Rigs arrive to prep the site, and with a rumble and a crumble the sturdy big "Dozer takes down a stone wall with no difficulty. But when he gives it a try, Little E winds up amid the debris. Big Loader moves up with a growl to transfer the broken stones into Dump Truck's load bed. GrrrrRrrrarrr! Little E tries lifting some JUNK, JUNK, JUNK! But the load in his little scoop is too much for the diminutive digger. He turns over with a CLUNK! Little E is embarrassed! Dump Truck orders him out of his way as he lugs his load off the site, chugging away mightily. Little E tries to help dig holes, but Backhoe shoos him away. Little E backs up, and his little headlight eyes get big as he watches the very tall Crane maneuver into position to swing a whole bridge across the pond to a little island. The new park is beginning to shape up. There is only one task left to do--planting an apple tree in the center of the little island. Little E is sad that he hasn't been able to help the Big Rigs at all. But, wait! There's a problem! The lovely little footbridge to the island is too small for any of the heavy-duty rigs to cross! Who is small enough to drive over the bridge and dig a small hole for the little apple tree? Who can it be? "Little E!" all little listeners will reply with glee, in Anna Dewdney's brand-new construction tale, Little Excavator (Viking Books, 2017). Dewdney's onomatopoetic rhymes are rhythmically repetitive, encouraging youngsters to chime in, and Dewdney's illustrations of the doughty little digger are a pure delight. Done in a departure from the familiar style in her Llama Llama series, her work in this story fits right in with the famous anthropomorphic earth movers of children's literature, from Burton's Mike Mulligan and His Steam Shovel 75th Anniversary to Rinker's Goodnight, Goodnight Construction Site. Dewdney's Little E has personality plus, staying right where he longs to be, and pleased to place that little tree where it belongs to make the new park perfect. Kids will identify right away with this eager little digger who proves he has the right stuff to help out, and Dewdney has again given children's literature a new classic with all the ample art and the heart of her earlier books. 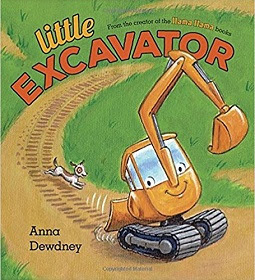 Kirkus stars their review and celebrates Anna Dewdney's latest, giving Little Excavator an "A+ for Little E and his creator!"